This description of Denisa Livingston's work was prepared when Denisa Livingston was elected to the Ashoka Fellowship in 2017. By shifting the focus from 'unhealthy people' to systemic challenges, Denisa is empowering Navajo communities to take control of food policy and lead a movement toward food sovereignty in Navajo Nation. 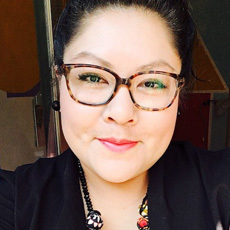 Denisa’s new approach to combating food deserts and diabetes in Navajo communities involves empowering community members to take control of food policy to promote local health solutions. Denisa is shifting the focus from unhealthy people to systemic challenges and the solution from personal choices to food sovereignty. She has built a process for rejecting “ch’iyáán bizhool” (a “junk food” term in Navajo) and promoting choices, first, by eliminating tax barriers that counterproductively favored junk foods over healthy ones; second, by taking advantage of the Navajo fundamental laws, where any Navajo citizen can propose legislation, to build a community movement toward food sovereignty; and third, by building a system for local Navajo chapters to fund and launch the health initiatives most relevant to them. She has spearheaded a tax on “junk food,” the first ever to be passed successfully and a model for future similar efforts, but beyond that, she has ensured that the funds raised by the tax go to a variety of local, culturally-­‐ relevant health initiatives chosen by the people in the Navajo communities. Throughout it all, she has emphasized that individuals have the power to change their food environment and their community’s health through their actions and choices: When choices are limited by lack of access to healthy food and culturally significant food, people can work together to change what is available to them. This process of activating citizens, scoring legislative victories against unhealthy food, and using the resulting funds to build and promote locally-­‐relevant healthy choices is a replicable one at every stage and has the potential to transform the Navajo Nation from a food desert to a food oasis, and not only a model for tribal communities but for other communities who want to transform similarly. Starting from her discovery that in some cases people can reverse diabetes as a result of good diet and exercise, she has been committed to making sure that opportunities to eat healthy food and participate in a variety of engaging physical and social activities are available for everyone. She has done this through the repeal of a 5% tax on healthy foods sold on the reservation, the landmark junk food tax, the community-­‐selected health programs funded by those revenues, and activation of community citizens working and campaigning to ensure her people have what they need. Her goal is to spread these ideas of culturally-­‐ rooted change agency to other tribes and indigenous communities throughout the globe. 99% of the Navajo Nation is a food desert. One in three Navajo people is diabetic or pre-­‐diabetic and that statistic is poised to jump to two in three if nothing changes in the next ten years. Youth are being taught about healthy eating in school, but their environments do not allow them to practice healthy foods habits and are rather surrounded by junk food in stores and few fruits and vegetables available at home. Providing people with knowledge about what constitutes a healthy diet does limited good if the only food they can realistically access is unhealthy. People are left with no sense of agency over their diets or their health in the face of these systemic barriers to good nutrition. There are programs funded by the federal government designed to promote tribal health, but those are not a complete solution. Often these programs are also designed from an outsider, non-­‐Navajo perspective and do not highlight cultural knowledge or Navajo traditions around healthy movement and nutritious foods. People are being given information disconnected from traditional knowledge, foodways, and cultural practices, which does little to engage them or help them feel empowered. These programs also do not tackle the access problems that limit people’s ability to make meaningful choices around food and physical activity, nor do they bring communities any closer to food sovereignty, the crucial right to healthy, culturally-­‐appropriate, sustainable food systems self-­‐defined by the community. Programs designed and imposed by and from outside the community will never promote food sovereignty and instead fundamentally detract from it. Denisa activates tribal citizens through a grassroots and culturally-­‐rooted strategy that brings in people who might not see themselves as advocates to challenge the systemic barriers that limit healthy options in their community and reframes ordinary citizens as assets rather than liabilities. This started with her discovery that in the Navajo fundamental laws, any citizen can present a bill in partnership with tribal leaders. She fought back against the precedent that elected officials conduct their business without listening to the voices of the people. She engages community members at all levels, including elders, youth, and women, groups who are often overlooked or not seen as assets. She and the grassroots advocates she engages presented variations on the junk food bill three times before it passed, with a 2% tax on junk food in addition to current Navajo sales tax(es), resulting in a combination of six bills they lead or supported to complete the entire process from the tax laws, fund management plan to the distribution guidelines. Many national public health critics say that the tax is too small to make an impact on people’s purchasing habits, but this tax achieves two goals. First, it creates a pool of money from which community-­directed wellness programs can be funded. They have raised 3.5 million dollars to date, which is split between the 110 Navajo Chapters. Each chapter is supported to choose a locally-­‐relevant use of their money to promote health and wellness creating social and physical environmental changes. These activities can include several examples like walking trails, equine therapy, classes in cultural activities for elders to get active, traditional healthy food preparation and cooking, improving access to clean water, and mitigating the damage done by uranium mining. Apart from providing the funds to allow citizens to choose health programs tailored to their community’s needs, this tax represents inroads against the stranglehold of food desertification and junk food. In addition to the 2% tax on junk food, Denisa and her team successfully pushed for repeal a 5% tax on healthy food sold on the reservation, so that people in her community no longer have to drive for hours and leave the reservation in order to buy cheaper fresh fruits, fresh vegetables, nuts, nut butters, seeds, and water. Taken together, these measures represent a challenge to the industries and systems that inundate communities with junk food while making nutritious foods scarce. For a community beginning to reconnect to their traditional foodways and movement activities as well as expanding the horizons of their available healthy options, these legislative victories are an engagement tool for making people think about the foods they buy in terms of the choices they have and the choices they can demand. She is working to spread these insights, participating in trainings for other tribes and for public health officials on how to activate community members and get them engaged in the changemaking process around healthy food identity, nutrition, and healthy activities. She is part of national and global coalitions regarding traditional indigenous gastronomy, bringing her community’s often-­‐unheard voices to the table while improving indigenous public health systems and food systems. Her goal is to transform the Navajo Nation from a food desert, with severely limited options and the health crises that result, to a food oasis, a model of wellness for other tribes and communities to learn from as they push towards food sovereignty systems that provide healthy, culturally appropriate food, and crucially, the ability for individuals and communities to choose the food that is right for them. Denisa’s family on her mother’s side has always been engaged in tribal politics, advocating for the health of her people, focusing on uranium contamination and its consequences. Her mother’s father died from direct contamination of uranium when the U.S. Government hired the Navajo people to mine uranium in the Cold War era with no protective gear. Denisa was greatly influenced by the suffering in her community, shaped by the injustices of her people and keenly interested in public health; presenting and sharing the Navajo’s past and present experiences of uranium contamination. She was introduced to the healthy food movement during her graduate internship. Shortly after, the group nominated her to lead and be the legislative speaker and organizer. From her family’s experience and her role in the sphere, she knew the power of grassroots changemaking. She has spent many years being a leader with no salary but determined to move forward, finding solutions with no budget. She has learned to operate from an empowered spirit rather than from a poverty mindset, on a mission to empower her people with purpose, vision, and a future.